"Japanese comfort food. Nothing fancy ..." Or so reads the Great Neighborhood Restaurant Award that Giovanna and I presented to chef Hisao Yamada at Renga-Tei tonight. But he asked if we wanted to try his cheesecake. Japanese cheesecake? In a word, ethereal. In more words, light, slightly citrus-y and well matched with fruits and a non-sweet mixed-berry sauce. If this is Japanese comfort food, the Japanese must be very comfortable. nama-kurimu cheezu keki...ah, unbaked cheesecake, set with agar. In japanese pastry shops, you find two kinds -- nama kurimu ('raw cream' and) and baked (made with whipped egg whites). Both are great, and remarkably different from NY Style. Oddly, Sara Lee's relatively inexpensive "French-style" cheesecake is one of these cold-set cheesecakes -- though not nearly as delicious as the japanese varieties (small batch does make all the difference, as well as the use of real cream cheese as a primary ingredient). Is the nama-kurimu cheezu keki (Japanese sounds so cool, at least to this occidental ear) always available or just as a special? I didn't see it on the menu, but it may have been there - I only briefly scanned the menu. My thanks also to Queijo for the info ... I was surprised he had it because I usually assume that dairy products and Asian diets don't mix (that whole lactose-intolerance thing). When I took my first bite of the cheesecake, the words 'panna cotta' entered my mind... from some vestigial recipe reading, I think, since I've never made or eaten panna cotta before. Sure 'nuff, when I looked up the recipe for panna cotta, it's basically cream, gelatin, & sugar, very similar to Renga-Tei's cheesecake. In addition to the cheesecake, it appears that they like to explore flavored gelatins in their kitchen. The cheesecake itself was glazed with a very flavorful, very tart lemon gelatin. There was a little pile of diced yellow gelatin in one corner of the plate which was not just danged pretty, but appeared to be gelatin-ized pineapple juice. And our neighbors at the sushi bar told us about the time the chef made red wine gelatin cubes [sounded like the same idea as Jello shots, but that actually tasted good ]. Our neighbors at the sushi bar were very interested, by the way, in our various culinary hi-jinks. The husband of the family told us about a party he'd recently attended in Kansas City where they'd ordered bbq from 6 different places so that they could compare/contrast/enjoy. I handed him a LTHforum card and told him he was clearly our kind of people. Thanks for the great description & pic! An award well-deserved! I've been dining at Renga-Tei since it opened, and many years before that when Koto was housed in the same building. In 1980, Koto was it as far as trad Japanese restaurants in the Skokie/Lincolnwood area went. Before then, if one ventured north from Chicago, all you had was Ron, Zin Mi, and maybe Ichiban. I did, however, work as a parking attendant in 1975 at Tanikaze Steak House on Lincoln Av. near Devon, which is now the current address of Via Veneto. The bartender at Tanikaze liked us 17-year-old parkers & busboys, and would sneak us a 'sayonara zombie' after work. Don't know what was in it...prob similar to a Long Island Iced Tea. the gelatin is probably agar-agar (japanese: kanten), which is used in many kinds of japanese sweets -- from bean 'cakes' (yokan) to cohi zeri (coffee jelly -- served with heavy cream) -- to fun fruit-based jellies and cakes (like the cheese cake). You can use agar-agar with pineapple (unlike animal-based gelatins, which become a nasty mush thanks to the enzymatic activity of bromelain). I love agar-agar -- fun to play with. We were just there Saturday night. Comfort food, indeed. Lovely Dining Companion and I had a very pleasant meal (notwithstanding the paramedics' evacuation of an unfortunate dinner in medias res). 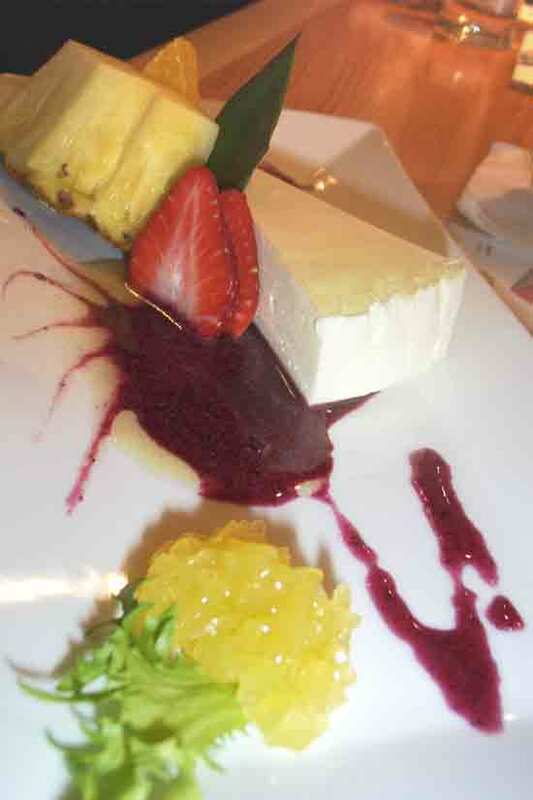 A lengthier post on the meal at a later date: for now, just posting to observe that I also had the cheesecake--it is on the menu, listed as Tokyo Lime Mousse Cheesecake. Seemed tofu-based to us. Exceedingly light; I guess I'm more a Lindy's (classic New York, extremely heavy) guy than I realized. But the reason for this post is to highlight the REAL dessert special that evening. On the specials board: drumroll, maesto...it was...(wait for it...) ORANGE JELLO!! As LDC (herself of Japanese descent) observed, "This is SO Japanese." Orange jello indeed. Dinner was very good, very reasonably priced and we will return. Last edited by Gypsy Boy on February 21st, 2006, 3:00 pm, edited 1 time in total. Gypsy Boy wrote: But the reason for this post is to highlight the REAL dessert special that evening. On the specials board: drumroll, maesto...it was...(wait for it...) ORANGE JELLO!! As LDC (herself of Japanese descent: her mother's Japanese born and raised and her dad was born here of Japanses parents) observed, "This is SO Japanese." Orange jello indeed. I think one of the plastic menu cards on the table might list the desserts saying "House Special: Orange Jello". I know I've seen it before because petit pois hates jello and I usually make a point of being annoying and asking her if she'd like some house special dessert. So, I finally got around to trying the orange jello at Renga-Tei. It's still on the plastic cards on the table, but no longer listed as "house special". After putting away about $40 worth of sushi, including a delicious salmon skin hand-roll (an assist to Ms. Wiv for turning me on to that one) and a few bites of their always surprisingly-tasty teriyaki, I asked the waitress for some orange jello. "I hear that it's very good," I said. She smiled and started to walk away. Taking a step back, she looked me in the eye and said, with great conviction, "Homemade!" It was very good. Served as two flat rectangles of opaque orange jello, layered inside with thin slices of pear. Tons of flavor, very good. Now I have to get dessert every time I go to Renga-Tei. I've had Japanese cheesecake before, but it was an actual cake, more like a pound cake, but very rich and cheesy. This sounds rather different. Was googling around for a Japanese orange jello recipe and came across this instead. Suzy Creamcheese wrote: I've had Japanese cheesecake before, but it was an actual cake, more like a pound cake, but very rich and cheesy. This sounds rather different. I also thought the cheesecake at Renga Tei is the type that's similar to pound cake, having tried it in a few places. Where did you try it? Is this still on the menu ? Anyone know of any other places in Chicago that I can get Japanese cheesecake ? I've seen Japanese cheesecake in the display cases at Chiu Quon Bakery on Wentworth and at Pastry House Hippo (inside Mitsuwa).